Great Taste Magazine 2013 January February Great Taste Magazine says goodbye to Christmas and New Year’s dishes and gets ready for Carnival with recommendations from OC chefs. Food is ubiquitous. It is vital to our livelihood and theuniqueness of various cultures. Traditional Christmas and New Year’s dishes are digestive memoirs, yesterday’s news. However, winter is still present and calls for the opportunity to elevate foods that adjunct to the season. In the January-February edition of Great Taste Magazine, we showcase presents for the reader to unwrap with their taste buds. Is 2013 going to be the year a healthy life style journey begins? Start today by purchasing Melissa’s 50 Best Plants on the Planet: The Most Nutrient-Dense Fruits and Vegetables in 150 recipes. Or try the Produce Pick of the Month: Cara Cara Pink Navel Oranges. This winter season try a healthy tart composed of fresh grapes straight from the vine, juicy pears or sweet crimson pomegranates. You can even engage in some authentic Cuban cooking and fix yourself some Guava and Cream Cheese Empanadas. If you can’t make it out to New Orleans Louisiana this February to participate in the vociferous revelry and watch the eloquent Mardi Grass parade, you can still indulge in the rich culture with your appetite. With Mardi Grass around the corner, be adventurous and try something tasty and comfortable to eat like an individual Chicory Coffee Bread Pudding with Bourbon Anglaise. Or spice up a dish with some Cajun Peppers or Creole; a sure way to electrify the mouth. The bold flavors of Louisiana grant access to experience a unique culture without ever experiencing a dent in the wallet or jet lag. Gumbo and Jambalaya truly capture the picturesque celebration. If you are nocturnal and don’t have the time to make a satisfying dish during the middle of the night, Corky’s Kitchen and Bakery (a 24-hour operating restaurant) offers a praised $10 and under menu with items such as pot pie, meatloaf, macaroni and cheese, fried chicken, muffins, and cookies. 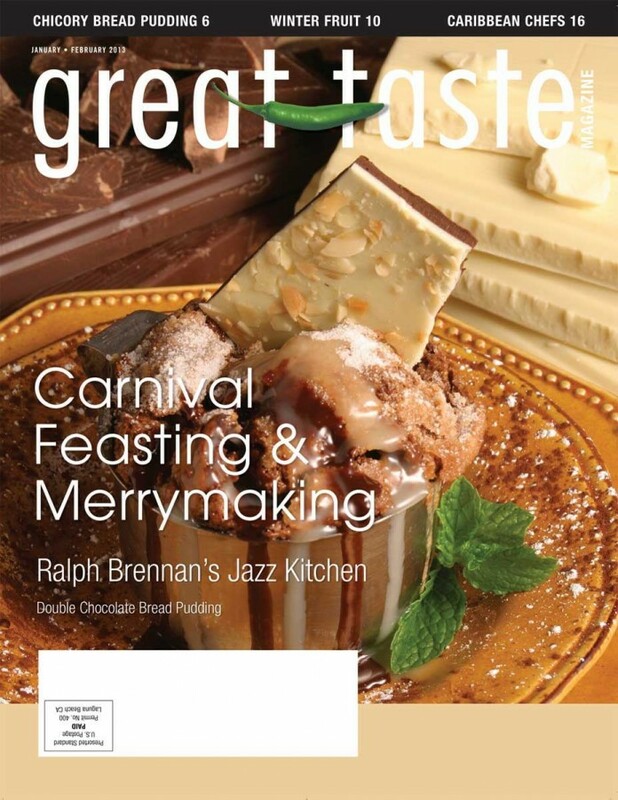 Great Taste Magazine 2013 Jan/Feb Issue covers the restaurants and the professionals with resources, recipes, beautiful photos and many tasty tidbits. Great Taste Magazine, the premiere connection to all the key decision makers in our local Southern California restaurant industry. Each month our 15 year-old full-color trade publication reaches thousands of the area’s top restaurant owners, general managers, executive chefs and buyers. Take a tour through the magazine. Each issue features a restaurant and local chef, and is packed with the timeliest information, critical operational tips and other industry news important to our readers.